Buy New Sony Alpha NEX 3NY (SELP16-50mm + SEL55-210mm) (Black) Digital Mirrorless Camera Free 8GB & Sony Case Malaysia At FotoZZoom! The NEX-3N lets you take the creativity that a DSLR offers with you in your pocket. Shoot detailed images in low light situations, take self-portraits easily and give your photos a professional touch. Enjoy taking beautifully lit shots up to 16.1 megapixels! The NEX-3NY has a DSLR-quality APS-C sensor which captures more light than most other interchangeable lens cameras, allowing more detail to reach the sensor. No more awkward angles; no more struggling to fit everyone into the shot. Flip the tiltable screen around 180° and frame the shot to perfection. Shoot from any angle you want. You can even take pictures of tall buildings without having to crane your neck looking up. The NEX-3NY’s power pop-up flash gives you an extra burst of light when you need it. Combined with maximum ISO sensitivity of 16000, the built-in flash ensures well-lit photos even in dimly lit environments. 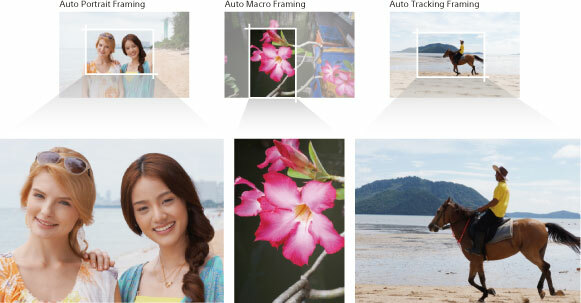 The ISO range even lets you capture warm naturally-lit scenes without using a flash. A handy lever allows you to zoom effortlessly even during a one-handed operation. 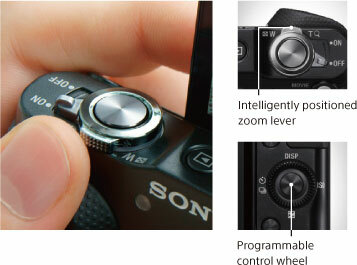 In addition, the right side of the control wheel can be used to adjust ISO or programmed as an Fn (Function) button. While some photographers have a natural eye for a shot, most of us could use a little help. Auto Object Framing helps bring out the best in your photographs by intelligently cropping images to maximise the appeal of your shots. It is entirely up to you whether to use what the Auto Object Framing function proposes. Film Full HD videos anytime and anywhere you want. The large APS-C sensor adjusts settings automatically for low-light conditions. Maintain focus even when you are zooming in and out. With a choice of manual or autofocus, and cinematic 25p shooting, you’re your own director. 15 Picture Effects allow you to transform ordinary images and videos into beautiful works of art. Evoke feelings of warmth and nostalgia with the Retro Photo effect, or use Pop Colour to emphasise the vibrant hues of your wardrobe. Experiment with different effects before taking the shot by viewing the effects in real-time on the large LCD screen.